Located a mere hour away from Sun Valley is the quaint mountain town of Stanley, Idaho. Walk back in time and experience what the West was like 200 years ago when Lewis and Clark passed through the area by taking a trip to Stanley, Idaho. The scenery will astound you and the friendliness of the community will make you want to stay. Stanley can be found at the crossroads of two "scenic byways" in Idaho's Rocky Mountains. It can only be reached by car, and can be found off Idaho State Highways 21 and 75, both of which offer scenic views through the mountains and by the Salmon River. Stanley is a small mountain town with several lodging options and a few places to eat. If you plan to stay in Stanley, it would be advisable to make reservations ahead of your arrival. 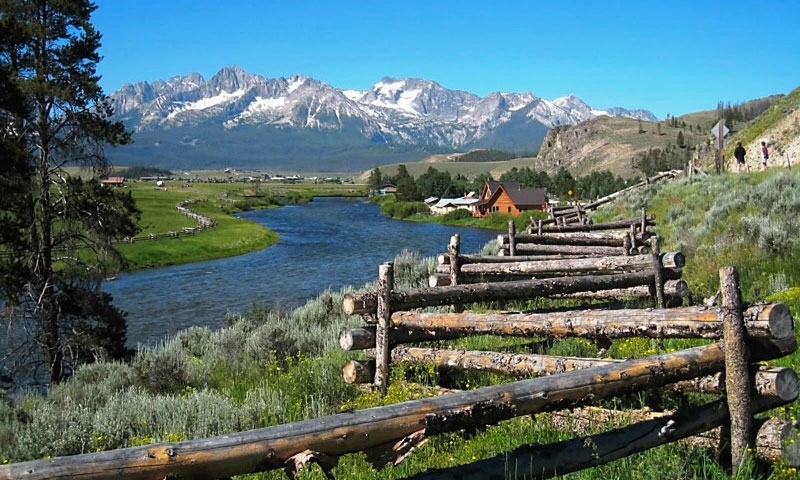 Surrounded by the majestic Sawtooth Mountains, Stanley, Idaho is awe-inspiring. In the summer, this is the place to bike, hike, fish, raft, and climb or just sit back and take in the entire splendor of the area. You can enjoy a wonderful meal on a deck next to the river, ascend to the top of a high mountain peak, or just relax by the Salmon River and be lulled to sleep by the sounds of the passing water. Fall brings splashes of vibrant oranges and yellows to the mountainsides and travelers enjoy the crisp mountain air. The area is less crowded in the fall and for those who do not mind the cooler mountain air; this is the time to visit. Winter brings a cover of white to the area, when the snow falls. The carpet of white is accented by the wonderful, pristine blue skies. . Activities include snowmobiling, cross-country skiing, hut skiing, snowshoeing and ski mountaineering, wildlife viewing, sightseeing, and photography. Come to the Stanley, Idaho and enjoy the view on foot, on horseback, on skis, from the back of a snowmobile, in a kayak or from a car. West of Stanley is Idaho's recently-developed state park, Land of the Yankee Fork. The Yankee Fork Gold Dredge is a symbol of the gold rush of the 1870s when prospectors came to pan gold from the fork. Custer and Bonanza were the two gold camps established during the 1870s. They are now ghost towns, on display in the state park which has its headquarters and information center in the town of Challis, 55 miles west of Salmon. The Stanley Museum focuses on the pioneer history of the town and the Stanley Basin. There are several accessible lakes close to Stanley. Little Redfish and Redfish lakes are just south of town, in the Sawtooth National Recreation Area. There is a visitor center between the two lakes open from June 1st to mid-September. Nip and Tuck Road offers a scenic side trip into the Stanley Basin, passing through mountain meadows filled with wildflowers, with great views of the Sawtooth range. To travel to Stanley from Sun Valley simply traveling north from Ketchum on Highway 75. The scenery will be fabulous as you travel through the Sawtooth National Forest and over Galena Summit. Take time to take advantage of the various places to pull over and enjoy in the breath taking views. Official site for Custer County, Idaho. Official site for the city of Stanley, Idaho.